SOCOTECO-1 has announced through its Facebook page the schedule of power interruptions this weekend November 22-23, 2013. Brgy. Lopez Jeana, Brgy. Puti, Brgy San Miguel of Norala and Faciolan Ricemill. Surallah Poblacion, Solivio Ricemill, Villanueva Plains, Agan Homes Surallah, Surallah Municipal Hall, Valdevieso Ricemill, Diente Ricemill and portion of Banga covering: Brgys.Liwanay, Cinco, Kusan, Rang-ay, Cabuling, San Jose & portion Brgy. Lamba. On Saturday, November 23, areas that will be affected by the scheduled brownouts are portions of Surallah, Banga, T'boli and Lake Sebu. Power interruptions in these areas will last up to 8 hours (8 AM- 4 PM). Line Clearing activities and ride-on preventive maintenance of the Line Maintenance Division -2 were the reasons stated by SOCOTECO-1 for these scheduled brownouts. T’boli Poblacion, Brgys Veterans, Edwards, Sinolon New Dumangas, Laconon, Kematu, Desawo, Afus. AMS Corporation, Upland Banana Corporation. Portion of Banga covering Brgys. Matlong, Derilon, Lam Apus, Lambingi, Lampari. Portion of Lake Sebu covering Bgry. Maculan, Halilan & Denlag. Portion of Surallah covering Portion of Dajay, Brgy. Colongolo, Little Baguio. Daraug Ricemill & Slaughter House. Also on Saturday, November 23, longer brownouts are to be expected in portions of the Municipality of Tampakan and in some areas of Koronadal City. Up to 9 hours of power outages are scheduled on these areas. 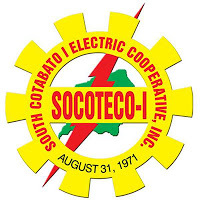 SOCOTECO-1 maintenance personnel will facilitate re-fusing of circuits, preventive maintenance and line clearing activities during these period. From Purok Spring, Brgy Morales, San Felipe, Libas, New Iloilo, Maibo, Bukay Pait, Dumadalig, Luayan, Tantangan Poblacion, Don Honorado, New Cuyapo, Mangilala, Magon ; ATI ,M & MB Ricemill, Sun Beam Ricemill, Agan Homes North.